The utilization of construction waste can be divided into raw material storage, resource processing, recycled aggregate storage, building materials processing and other processes. The resource treatment process is the core of the entire construction waste treatment plant. Through the resource treatment,the separation of various sundries in construction waste can be realized, and the recycled aggregates of different specifications are produced according to the raw material requirements of the subsequent building materials. According to the treatment function, it can be divided into: sorting and impurity removal, crushing and shaping, screening, aggregate reinforcement, etc. The sorting and impurity removing of construction waste can be divided into two ways: manual and mechanical sorting: mechanical sorting is based on the physical properties of the construction waste in terms of size, magnetic properties, specific gravity, etc., mainly including screening, air separation, magnetic separation, hydraulic flotation and so on; manual sorting is mainly for large-sized debris that is difficult to separate by general mechanical methods. Crushing is one of the core technologies of construction waste regeneration aggregate production. 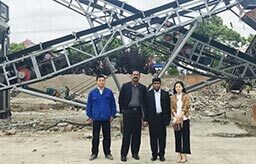 The construction waste material has medium to soft strength and many cracks. The crushing methods can be squeezed or impact crushed. Common squeezed crushers include jaw crusher, cone crusher, etc. Impact crushers have counterattack crusher, vertical impact crusher, hammer crusher, etc. 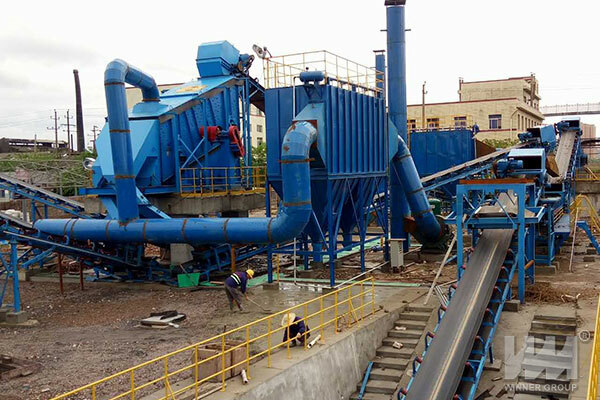 In the production technology of construction waste recycled aggregate, the function of screening is generally reflected in two aspects: one is used for the separation of debris such as muck in construction waste; the other is for the classification of aggregate after crushing. Commonly used equipment mainly includes vibrating screen, drum screen, grizzly screen and so on. separation, cement slurry stripping, etc.